I was so proud of my nephew today, he lit the coals, assembled this fun Frito Casserole and did a great job of cooking it in my 12 inch dutch oven. This is one of those dishes that is tailor made for a group of young 'Frito Banditos' but so good that the adults end up going back for seconds. Imagine Tex Mex Wontons. The corn chips transform into a light, crispy, cheesy topping when baked, covering a layer of creamy, spicy hamburger. This cooks in a jiffy, once you brown the hamburger and onion all you need to do is heat the rest of the ingredients until they are bubbling and the cheese has melted. This was ready in 20 minutes with 12 coals in a circle around the bottom and 18-20 on top. Garnish with a spoonful of sour cream and feel like a kid again when you dive into this funky, filling casserole. Brown beef, chopped onion and garlic over a full compliment of coals; drain. Add the soup, corn and chilies; stir to mix well. Cover with bag of corn chips. Pour can of enchilada sauce evenly over chips. Top with cheese. Bake at 350 degrees for 15-20 minutes or until heated thoroughly and cheese has melted. Serves 4-6. Hi Liddy, it's been a while since I've posted. This is another really good and easy recipe the kids liked. It has an interesting blend of textures with the Fritos and meat mix part. The leftovers don't keep very well in the refrigerator though. 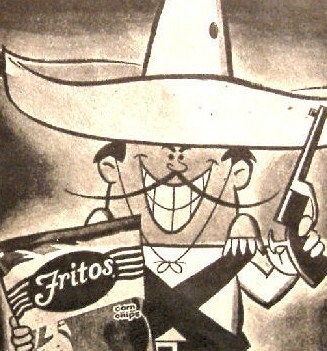 The Fritos get soggy. But fresh from the dutch oven it's definitely worth making. K.C.